Braised pork shoulder… It’s magically delicious! Monday: Braised pork belly. Tuesday: Braised pork shoulder. Wednesday: Barbecued pork ribs. If he had prepared pig trotters on Thursday, I was going to start ransacking the house looking for the pig carcass he was obviously hiding. Not that I’m complaining. Doctors may not agree, but I believe a steady diet of pig leads to healthy — or at least, happy — living. And that is why we’re sharing with you Tuesday’s masterpiece: Braised pork shoulder. The result of combining these two divine things? 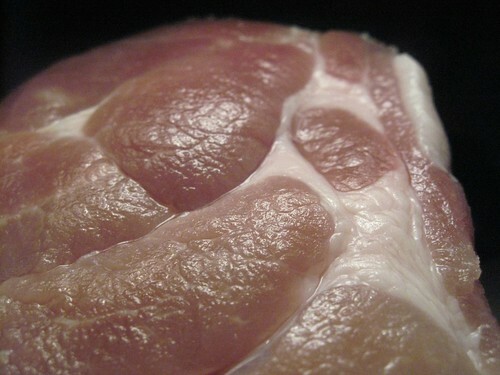 Heavenly, tender, succulent pork shoulder and a lovingly reduced sauce that will transport your taste buds to nirvana. I’m not exaggerating. Don’t believe me? Try it for yourself. I do love some pig. I’ve made more than a few pork dishes in the past week, but how’s that my fault? I mean, I didn’t make the pig that delicious. But while this dish does demonstrate the magic of pig, it also is an example of the greatest technique I learned in culinary school — sauce making. There is perhaps nothing more French than the act of making sauce, and you have to give those cheese-eaters credit: Uninteresting morsels of food can be turned into something really special with the right sauce. In this dish, the sauce is made by reducing the cooking liquid to a near-glaze until it it is rich, delicious, and enhances the flavor of the meat. What’s more, this dish also works with a newer obsession of mine: beer. I have to admit, I spend an inordinate amount of time at Rick’s Wine and Gourmet here in Alexandria, Va. I’ve even become friends with my local beermonger and fellow blogger, Nick. The store and Nick have been my cheerful suppliers as I continue to plow along. But this post is about demonstrating the glorious potential of beer, not about the high likelihood of seeing me in my little beer shop around the corner. Here the beer is part of the braising liquid. 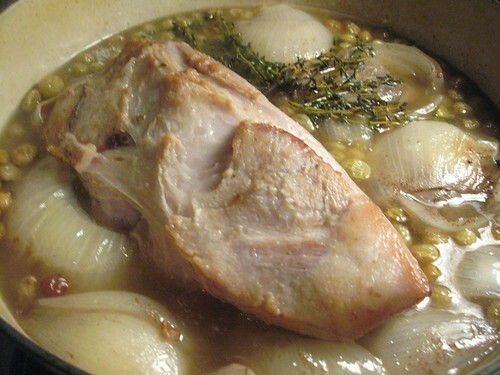 The pork shoulder is browned and then slowly cooked in combination with Belgian strong ale and chicken stock. Along with their higher alcohol content, Belgian strong ales are known for their intense flavors that I feel pair naturally with pork. 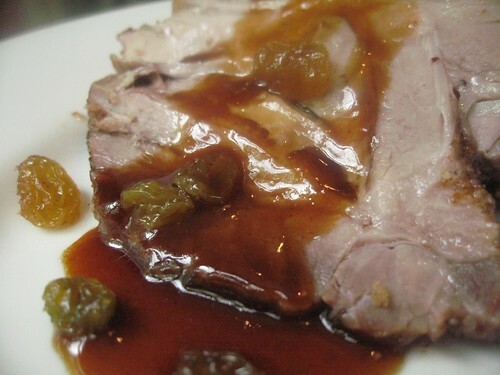 Here, I used a dark or golden variety of this style that exhibits fruit, citrus rind and spice; it reminds me of the classic pairings of pork with apples and cinnamon. The sauce that is rendered from the cooking liquid has a sweetness and a nice acidity — and I’m fairly confident would make my fingers delicious enough to eat. 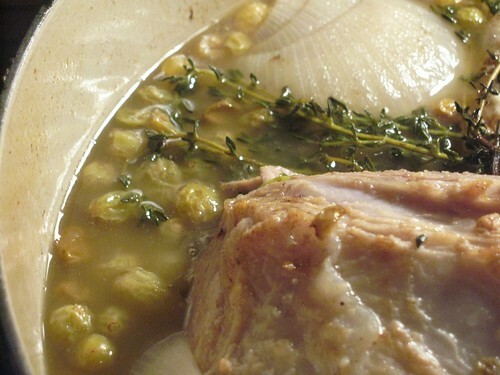 Finally, this recipe is an homage to Daniel Boulud. While we were living NYC, my wife and I went to his flagship restaurant, Daniel, in midtown. For both my wife and I that experience was incredibly memorable not only for the amazing meal, but for the hospitality heaped upon us by the staff. After finding out I was a culinary student, the chef did those little extras that made us feel lavished upon. Beyond a clear demonstration of what it means to receive multiple Michelin stars and four stars from The New York Times, it showed us a sense of generosity that we’ll try to show to others. This recipe was inspired by his recent book Braise. 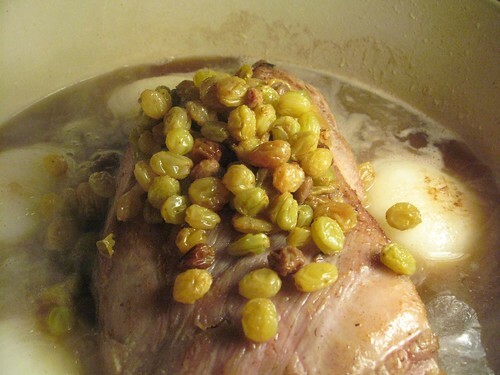 He has a recipe for pork shoulder with hazel nuts and Jerusalem artichokes (AKA sunchokes). 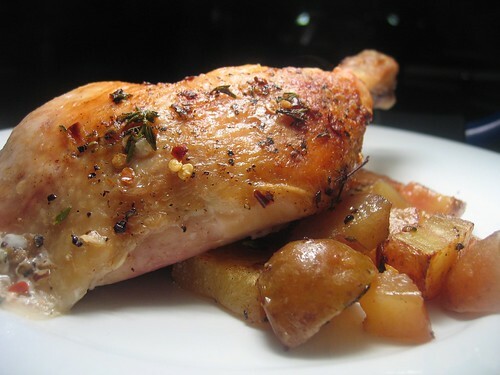 While I liked the original version, I changed it to include more American flavors such as bourbon and pecans, gave up white wine for my heartier ale and swapped the very earthy Jerusalem artichokes with the milder new potatoes. The recipes do vary in grades from there, but I’d like to think this version is… I won’t say better, just more pleasing to a pair of people. Nothing lost in translation: Sunchoke and Potato Gratin. You say po-TAY-to, I say po-TAH-to. You say sun-CHOKE… um, I say sun-CHOKE. My husband says grah-TAHN. I say GRAW-tin. It doesn’t quite make for a catchy song, but it does make for a damn fine dinner. 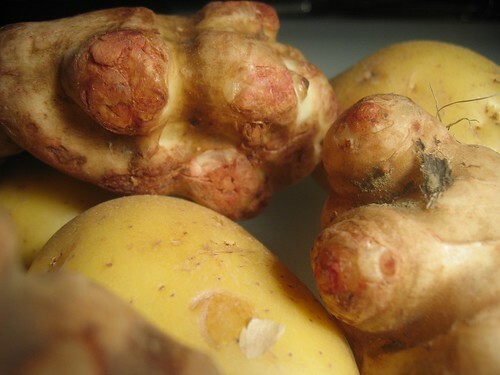 However you pronounce it, sunchoke and potato gratin is delicious. I love a good gratin. Who doesn’t? Layers of silky, creamy potatoes in a rich buttery sauce… maybe some onions, garlic, and herbs nestled into the mix… and topped with a layer of delicious cheese, of course. Paired with a meaty, savory entree or just forked in as a solo act, gratin is oh-so satisfying. Anyway, here’s where the tension builds, folks. Would the addition of these foreign little vegetables throw off the gratin magic? I’m happy to report that sunchokes make an excellent addition to your familiar old gratin. 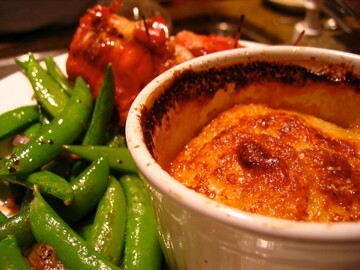 The hint of sweetness that they add melds beautifully with the herby, creamy sauce of the gratin. And their potato-like texture makes it hard to distinguish which starch you’re sinking your teeth into. It was a gratin not quite like one I’d ever had before (and I’ve had a few), and it was good. Damn good. Enjoy, folks! 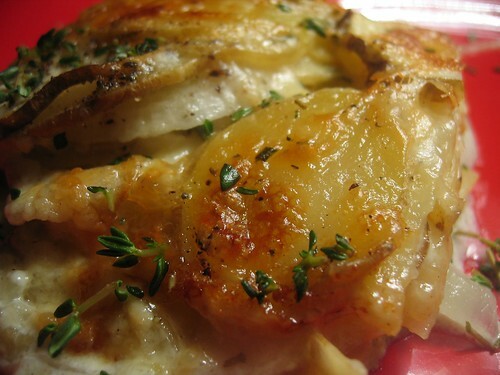 Click here to download the recipe for Sunchoke & Potato Gratin. It was the chicken. Under a brick. With the potatoes. Chicken under a brick doesn’t sound glamorous, does it? In fact, it may not even sound appetizing. The idea of a bit of poultry stewing under some sandy building implement doesn’t get the saliva flowing. That is, unless you’ve actually had chicken under a brick. In which case, you’re willing to knock down old women and children to cut a path to the serving station – fork in hand and plate outstretched. 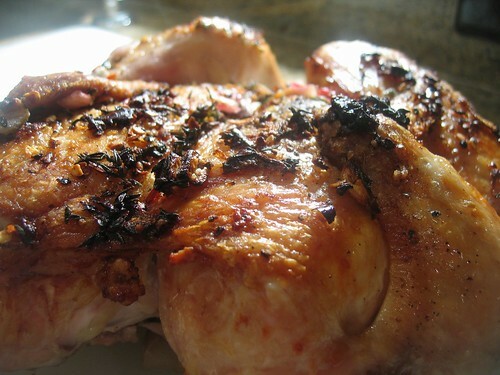 Chicken under a brick – or geek chicken, as my husband fondly calls it – is a delicious, flavorful and moist roasted bird. But that’s only the half of it. In addition to beautiful and juicy meat, housed in a herb-incrusted and crispy skin, are wondrous, aromatic and deliciously decadent roasted potatoes. That’s correct, they come right with the recipe! 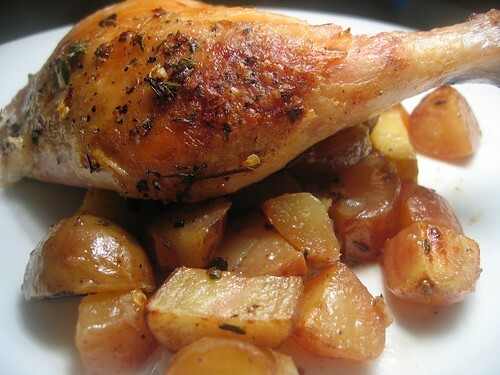 The potatoes cook right under that bird, soaking up the fatty goodness that drips down into the pan and melding with the tangy thyme seasoning mix the potatoes are lovingly tossed in. It’s magical, folks. The best part is, my husband can be easily persuaded to make this recipe because it’s so darn easy. You don’t even need a brick – my husband uses a pan weighed down with 32 oz cans of whole tomatoes. Genius, I tell you. So read on for the recipe, and eat on for satisfaction! 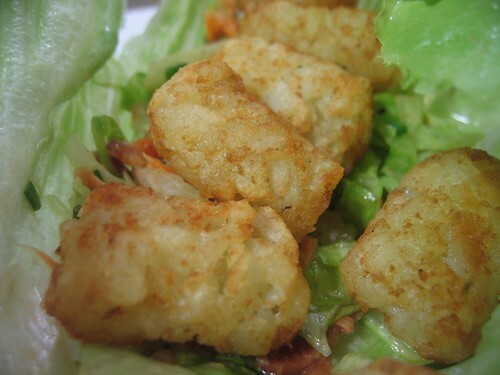 Husband’s tater-tot salad (above) squares off against wife’s (below). I say obsession because it’s not an unusual occurrence over the years for my wife to turn to me and say, “You know… I could really go for some tater tots right now.” I like them, but I could say that until this project, I had never bought them in my entire life. So most of her requests were met with me rolling my eyes. Therefore, when the discussion of tater tots reached a glowing stage at the restaurant, I was rather amused. 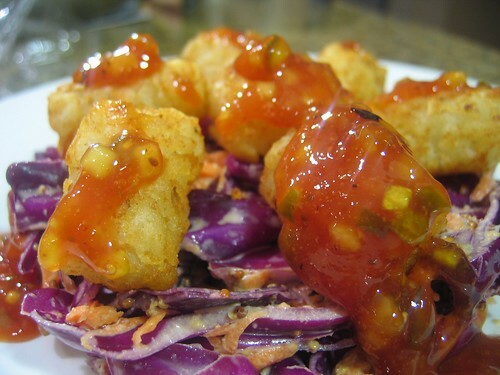 I can’t remember who said it first, but the words “someone should invent tater tot salad….” were uttered. My wife and I looked at each other and agreed. We would heed that call. The story now turns a corner. My wife decided to change it up: “I” won’t invent the tater tot salad, “she” won’t invent tater tot salad, and “we” won’t invent tater tot salad. No, we would enter into an Iron Chef style death match! We were quickly off honing our thoughts and ideas. The results are hers to describe, but let’s just say that her tater tot salad was awesome. If she says anything otherwise, she’s being overly modest. Also, these recipes are dedicated to our good friends Toby, Andrea and Mark for their truly inspiring idea. Yes, the prosciutto-wrapped (and grilled) chicken was very good. But the Po…ta…toes… were delicious. Hence, their heroic treatment in the photograph. Their superpowers stem from cheese, of course. Notice the reappearance of those photogenic beans. We love ’em. I should say, my husband and I love them. One of our diners, let’s call her “Tessie,” shuns them from her plate. (Her name is made up, but her loathing of greens is real.) We’re working hard to convince her they’re tasty and delicious, but she, ever polite, will not be swayed. Will our powers of persuasion win out over years of non-green eating? Stay tuned. This was an experimental dinner on the husband’s part. It was largely a success. Of course, his diners, growing ever-more fat and self-satisfied on a diet of gourmet dinners, ventured to make a few suggestions to improve it in the next go round. (Except for the potatoes, of course. Near perfection is hard to improve upon.) But I’ll get to that later. You are currently browsing the archives for the Potatoes category.